Mother’s Day memories are made by doing something fun with my family. Two years ago, we were at Walt Disney World with my parents and our boys for their first full vacation day in Orlando. Sad to say, we can not be at Disney every Mother’s Day. 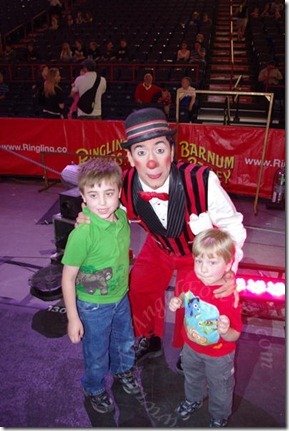 This year, we decided to take the boys to the Ringling Bros. Circus. After NHL came home from his Hebrew lesson, we had a quick snack and packed the boys up to go to the Times Union Center. NHL and JSL had never been to see a circus. What I didn’t realize at the time was that neither had TechyDad. The three boys were going to a major milestone. We arrived early enough to head down onto the floor for the all access preshow. There were clown noses to wear, performers to meet, and mini-acts to view. It was a lot of fun. At one point, we happened to see one of the clowns standing alone. The boys wanted to go over for a photo. I decided to stand back and capture this memory on video. The comedic timing, stage presence, and athleticism of this clown blew us away. Many more memories to share soon. Have you been to the circus or taken your children? I would love to hear your circus memories. I didn’t have high expectations of the circus; frankly I’ve always been a little bit freaked out by clowns and performing animals. But I was very impressed and entertained by Barnum #200, it was a fun show!